11th lunar month of 1784: he made his first appearance on stage, at the Kiriza, where he received the name of Ichikawa Bennosuke and played with his master Ichikawa Danjûrô V in the drama "Jûni Hitoe Komachi Zakura". 11th lunar month of 1789: Ichikawa Bennosuke took the name of Ichikawa Omezô I at the Nakamuraza, playing two roles in the kaomise drama "Komachi-mura Shibai no Shôgatsu". 19th day of the 11th lunar month of 1794 : his father Ichikawa Monnosuke II died. 1st lunar month of 1796: premiere at the Kiriza of Namiki Gohei I's drama "Suda no Haru Geisha Katagi"; Omezô played the role of Kanaya Kingorô [casting]. 9th lunar month of 1796: the play "Hikosan Gongen Chikai no Sukedachi" was staged for the first time in Edo, simultaneously at the Kiriza and the Miyakoza; Omezô played the roles of Todoroki Dengoemon and the yakko Tomohei in the former theater [casting]. 6th lunar month of 1797: the dance-drama "Tsumoru Koi Yuki no seki no To" was revived for the first time, at the Kiriza; Omezô achieved a great success by playing the role of Ôtomo no Kuronushi [casting]. He also played the roles of Yuranosuke and Jûtarô in the drama "Taiheiki Chûshin Kôshaku". 11th lunar month of 1799: Omezô played at the Moritaza the role of Katô Masakiyo (the superhero in the "Shibaraku" scene) in the kaomise drama "Happyakuchô Hisago no Kanzashi"; the role of the villain was played by Morita Kan'ya VIII. 1st ~ 10th lunar months of 1800: tour in Ise and in Kamigata. 11th lunar month of 1800: Omezô went back to Edo and achieved a great success at the Nakamuraza by playing four roles in the kaomise drama "Genji Kumo Kogane no Kumadori". 6th lunar month of 1802: the drama "Natsu Matsuri Naniwa Kagami" was produced for the first time at the Kawarasakiza; Omezô played the role of Danshichi Kurobê [casting]. 11th lunar month of 1804: Omezô played at the Kawarasakiza the roles of Watanabe Tsuna, Usui Sadamitsu, Sakata Kintoki and Urabe Suetake in the kaomise drama "Shitennô Momiji no Edoguma", which welcomed in Edo the Kamigata actor Arashi Danpachi. 3rd lunar month of 1805: Omezô played in the same theater the role of Sukeroku in the drama "Sukeroku Yukari no Edo Zakura", which was staged to commemorate the 6th anniversary (7th memorial service) of late Ichikawa Danjûrô VI; the roles of the courtesan Agemaki and Ikyû were played by Nakayama Tomisaburô I and Onoe Matsusuke I. 30th day of the 10th lunar month of 1806 : his master Ichikawa Hakuen I died. 5th lunar month of 1807: Omezô played at the Nakamuraza the role of Soga Gorô Tokimune in the bombastic "Ya-no-Ne" scene; the role of Soga Jûrô Sukenari was played by Bandô Mitsugorô III. 7th lunar month of 1808: premiere at the Nakamuraza of Segawa Jokô II's drama "Zôho Izari no Adauchi"; Omezô played the role of Fudesuke [casting]. 10th lunar month of 1808: premiere at the Nakamuraza of the drama "Kuruwa Bunshô"; Omezô played the role of Yoshidaya Kizaemon [casting]. 1st lunar month of 1812: Omezô's rank in the Edo hyôbanki, tachiyaku section, was jô-jô-kichi (superior - superior - excellent). He was also the kanjiku for tachiyaku actors. 1st lunar month of 1814: premiere at the Moritaza of the Nagauta-based dance "Shôfudatsuki Kongen Kusazuri"; Omezô played the role of Kobayashi no Asahina [casting]. 1st lunar month of 1818: Omezô's rank in the Edo hyôbanki, jitsuaku/katakiyaku section, was jô-jô-kichi (superior - superior - excellent). 1st lunar month of 1823: Omezô's rank in the Edo hyôbanki, jitsuaku section, was kô-jô-jô-kichi (meritorious - superior - superior - excellent). 3rd lunar month of 1823: premiere at the Ichimuraza of Tsuruya Nanboku IV's drama "Ukiyogara Hiyoku no Inazuma"; Omezô played the role of Honjô Sukedayû [casting]. 6th lunar month of 1824: Omezô appeared on stage for the last time, at the Nakamuraza, playing the role of Midaroku in the drama "Ichi-no-Tani Futaba Gunki". He retired and took the name of Ichikawa Benzô II (his father Ichikawa Monnosuke II's third stage name). 7th day of the 6th lunar month of 1833 : Benzô died in Edo. 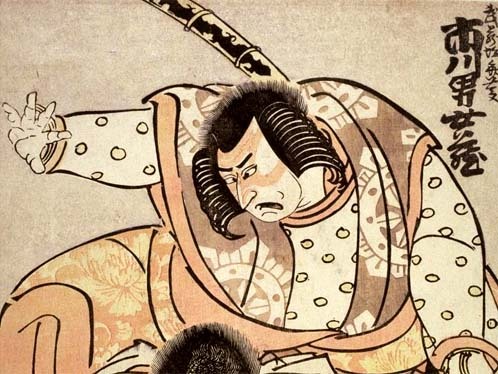 Ichikawa Omezô I was a talented tachiyaku actor of the end of the eighteenth and the beginning of the nineteenth centuries. He was particularly appreciated by the Edo audience in aragotoshi and jitsugotoshi roles. He became a great jitsuaku in his latter years. The 7th day of the 6th lunar month of the 4th year of the Tenpô era was the 23rd of July 1833 in the western calendar. The 19th day of the 11th lunar month of the 6th year of the Kansei era was the 11th of December 1794 in the western calendar. The 30th day of the 10th lunar month of the 3rd year of the Bunka era was the 9th of December 1806 in the western calendar.